Good Thursday all . 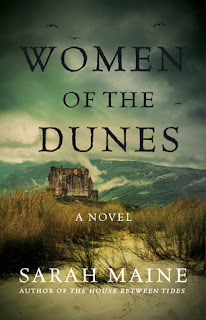 Today we are going to review WOMEN OF THE DUNES by Sarah Maine . A beautifully told and intriguing mystery about two generations of Scottish women united by blood, an obsession with the past, and a long-hidden body, from the author of The House Between Tides. Libby Snow has always felt the pull of Ullaness, a headland on Scotland’s sea-lashed western coast where a legend has taken root. At its center is Ulla, an eighth-century Norsewoman whose uncertain fate was entangled with two warring brothers and a man who sought to save her. Libby first heard the stories from her grandmother, who had learned it from her own forebear, Ellen, a maid at Sturrock House. The Sturrocks have owned the land where Ulla dwelled for generations, and now Libby, an archaeologist, has their permission to excavate a mysterious mound, which she hopes will cast light on the legend’s truth. But before she can begin, storms reveal the unexpected: the century-old bones of an unidentified man. The discovery triggers Libby’s memories of family stories about Ellen, of her strange obsession with Ulla, and of her violent past at Sturrock House. As Libby digs deeper, she unravels a recurring story of love, tragedy, and threads that bind the past to the present. And as she learns more of Rodri Sturrock, the landowner’s brother, she realizes these forces are still at work, and that she has her own role to play in Ulla’s dark legend. This book had me hooked by the second chapter . The author entwines the stories of three different women of different times and how they are all entwined together . Let me take you to Scotland where the lives of Ulla , Ellen and Libby come together . The characters are well written and complex. The author has written some very strong women . Ulla a 18th century Norse woman . She has escaped her abusive husband with his brother . Which starts all of this intrigue . She is left on the shore with a dying man and the priest who actually holds her life in his hands . She is such a good character . I just wish the author would of brought her out just a little bit more . She would of been a great character to get to know. From what we get from her she is so distraught over the death of her love . There is such a darkness around her at some points in the story . Ellen is the second character entwined with Libby and Ulla. She is a maid at the Sturrock mansion and is torn between two men . She is in love with Alick , the sweet younger brother who likes to talk and be around Ellen . And then there is Mungo the older brother who in my opinion is a very abusive man . Ellen to me seems just a little naïve most of the time . She is scared and also trying to keep a roof over her sick mothers head . We do see her have a bit of a back bone towards the end of the book and there is actually more to Ellen then the author lets on at first. Now Libby is the linch pin that pulls the other two characters together . She is an archeologist and knows all the stories behind Ulla and her past . When she starts to figure things out you see Libby become a really strong woman and she takes on those that want to destroy the happiness that she has found at the Sturrock house. There is so much going on with each of these woman you just can't stop reading . The author takes us on an adventure with twists and turns . I started this book in the evening and I honestly couldn't put it down . The characters are really complex and you just want to see how they all fit together . I loved the mystery and the intrigue . There are three voices in the book but they all blend together. The only thing I have to say is it did kind of lag in a few spots . Over all I truly enjoyed this book and the characters . This is the first book I have read by this author and I truly love her writing style . You don't get confused with each character and you actually start to care for each character. So when this book comes out I would say put it on your summer reading list . You will be sucked into the story and the scenery and love of Scotland .